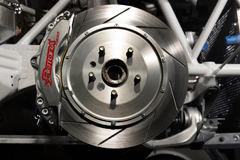 Rotora is a worldwide aftermarket designer and manufacturer of high-performance braking systems and brake components ranging from street performance to full race. Today, the company continues to manufacture a wide variety of high-performance brake upgrade systems and components for the Domestic, Import, European, and Truck/SUV applications. 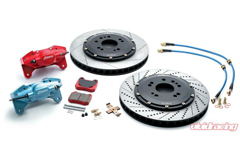 Rotora manufactures the Street Challenge high performance brake systems for street and track use that enables superior brake modulation while improving overall pedal feel to ensure equal distribution of weight transfer when braking. 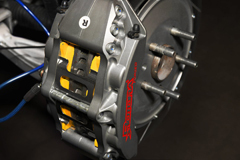 The Super Challenge system is for true racetrack-specific driving offering higher strength aerospace aluminum alloy compared to Rotora's current street application calipers; these full-race calipers are engineered to provide a 15% reduction in weight without losing stiffness and performance. 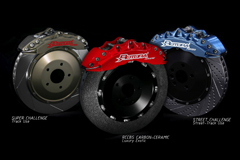 Rotora introduces the latest version of Carbon-Ceramic Brake System (RCCBS), using an all-new innovative Carbon Fiber Reinforced Silicon Carbide (C/SiC) formulation to ensure a significant reduction in rotational mass and uncompromised fade-free performance under all extreme driving conditions. RCCBS is designed exclusively for production-based vehicles including Audi, Bentley, BMW, Ferrari, Jaguar, Lamborghini, Range Rover, Maserati, Mercedes-Benz, Nissan GT-R, Porsche, and many more to come. 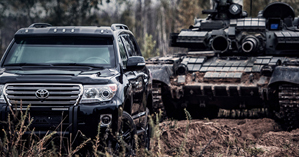 Rotora also designs and manufactures a wide range of heavy-duty brake systems and brake components for armored and defense vehicle applications for the private sectors. 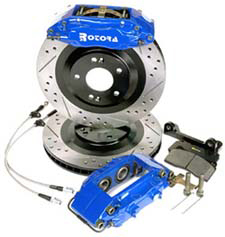 Rotora offers a full line of services parts for all of their brake systems. Rotora's high-quality is maintained through strict ISO quality control in their production facilities, which assures that every component meet worldwide ISO quality and safety standards. 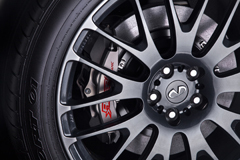 Need to know if a Big Brake Kit is compatible with your wheel size? Call us today at 1-888-344-4949 so we can verify your vehicle's information to ensure the kit will fit. Founded in the fall of 1999, U.S.-based Rotora is a major aftermarket manufacturer of high performance brake systems and braking components including racing calipers, brake discs and brake pads ranging from Original Equipment aftermarket replacement parts to racing and high performance upgrades. 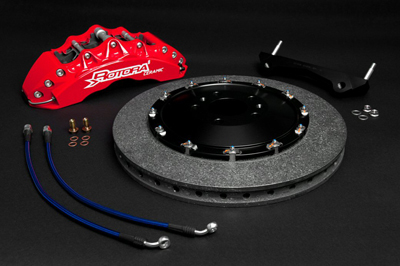 Previously established as an Original Equipment Manufacturer (OEM) of aftermarket brake components (including calipers, brake discs, drums and pads) in the mid 1980's, Rotora utilized its technical and production knowledge gained from OEM to offer performance enthusiasts the very best in high performance brake upgrade systems. As racing enthusiasts, the founding partners of Rotora share the same passion and dream: to develop an uncompromising braking system to meet and exceed all required brake performance specifications in the severest conditions in the motor sports field. 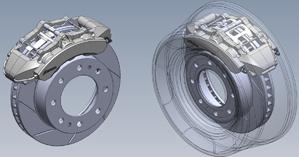 This drive towards higher innovative braking solutions not only involves exploring new materials and new technologies, but also the search for a dynamic brake design to achieve the greatest balance between efficiency, stability, reliability and controllability. This long pursuit resulted in the development of the 2-piston, 4-piston, 6-piston, 8-piston and the new 12 piston racing caliper brake system. 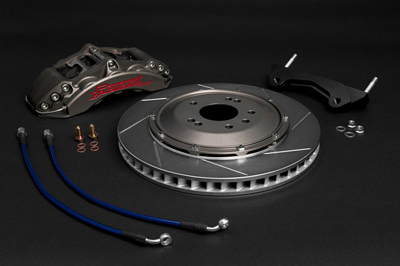 Through rigorous research, design, engineering, along with extensive road and track testing to produce the most innovative brake systems available on and off road, Rotora's high-quality and specifications are maintained through strict quality control inspection, which assures that every component meet worldwide ISO 9000 quality standards. With 3 company-owned production foundries across the globe, Rotora oversees all phases of development from conceptual design to final production. Rotora proves its braking system technology with multiple road race motorsport venues including SCCA and D1 Grand Prix. Today, the company continues to manufacture a wide variety of the latest applications in high performance calipers, brake discs, brake pads and complete brake upgrade systems for Domestic, Import and European applications. The success of Rotora could not have been made without the productive partnership with organizations from manufacturers to race teams. These partnerships play a crucial role in Rotor's continuing advancement. Craftsmanship, innovation and performance: these are the commitments Rotora offers to consumer demands for the very best in quality, safety and cost performance products. 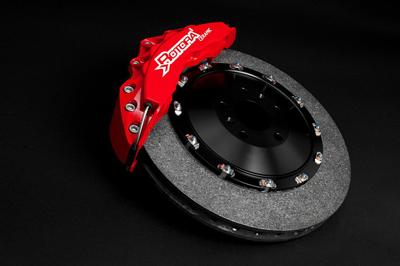 Made of billet aluminum alloy and CNC-machined to ensure the highest quality, Rotora's High Performance Brake System enables superior brake modulation while improving overall pedal feel to ensure equal distribution of weight transfer when braking. To achieve this proportional front-to-rear brake bias, Rotora's opposing piston calipers are fine tuned by increasing the clamp load to the optimal level while utilizing the stock master cylinder to retain overall front-to-rear brake bias. 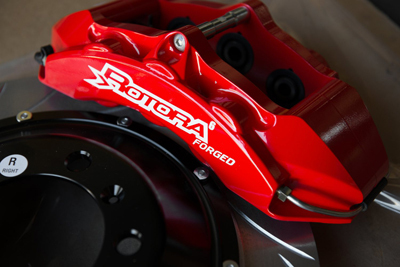 Rotora's full big brake system design delivers excellent initial bite, exceptional modulation and consistent pedal feel for street and track use applications. All systems are ABS compatible and direct bolt-on replacement with minimal modifications required. 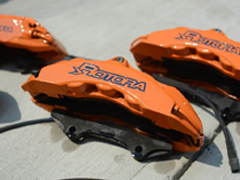 Rotora billet aluminum alloy 2, 4, 6, or 8-piston racing calipers with sequentially-sized piston bore sizes engineered to each specific vehicle. Note rotora no longer offers the 12-piston caliper. Rotora billet aluminum hat with "floating" disc assembly to reduce heat-related stress and unsprung weight. Rotora one-piece vented or two-piece heat-treated directional vane disc system to improve airflow/cooling under severe braking. Slotted or drilled &amp; slotted oversize discs up to 16" (405mm) to ensure equal heat dissipation and increase thermal capacity while relieving the disc and brake pad surface free of excess debris. Rotora ceramic formulated pads designed for extreme street and track applications with high co-efficient of friction and high-temperature fade resistance. 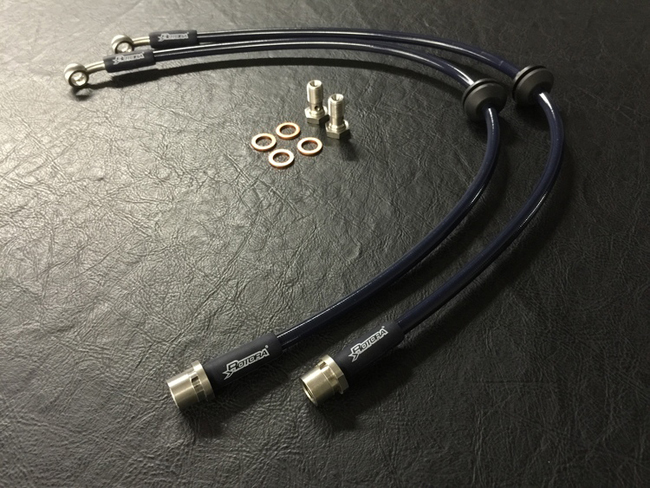 Rotora DOT-compliant stainless steel braided brake lines to improve stiffer pedal feel and prevent brake hose expansion. Rotora carbon steel (SC45) mounting brackets (depending on application) and hardware. Standard Caliper Colors: red or metallic blue. Custom Caliper Colors: dark blue, chrome, gunmetal, gold, silver, black or yellow (lead time of 60 days depending on application). Ceramic Pads: Rotora offers a wide range of ceramic compound pad grades. Disc Types: Plain, slotted or drilled oversized discs. Rotora no longer offers a drilled and slotted disc option. 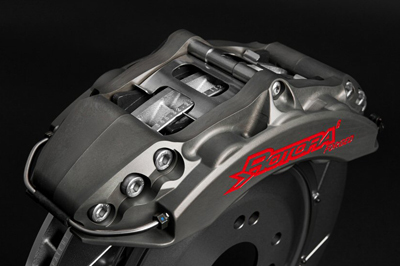 Made of billet aluminum alloy and CNC-machined to ensure the highest quality, Rotora's 8-Piston Caliper Brake System enables maximum brake modulation while improving overall pedal feel to ensure equal distribution of weight transfer when braking for larger, heavier, higher horsepower vehicles. 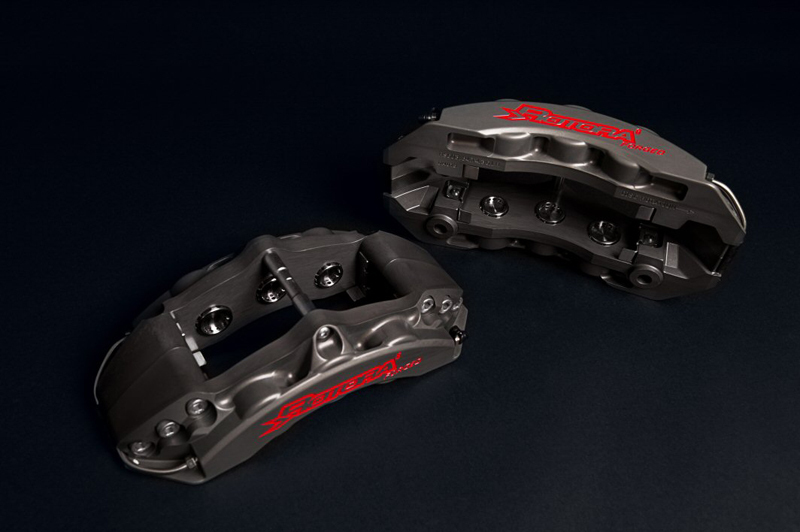 As the largest brake system offered for SUV and Truck applications to date, sequentially-sized pistons in the calipers are fine tuned by increasing the clamp load to the optimal level while utilizing the stock master cylinder to retain overall front-to-rear brake bias. 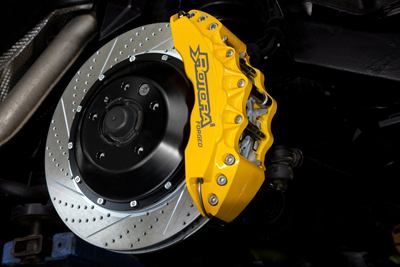 Each Rotora 8-piston caliper contains 4 ceramic-formulated brake pads with 2 sequentially-sized pistons pushing each pad to deliver excellent initial bite and uniform pad-to-disc contact, thereby eliminating tapered pad wear. 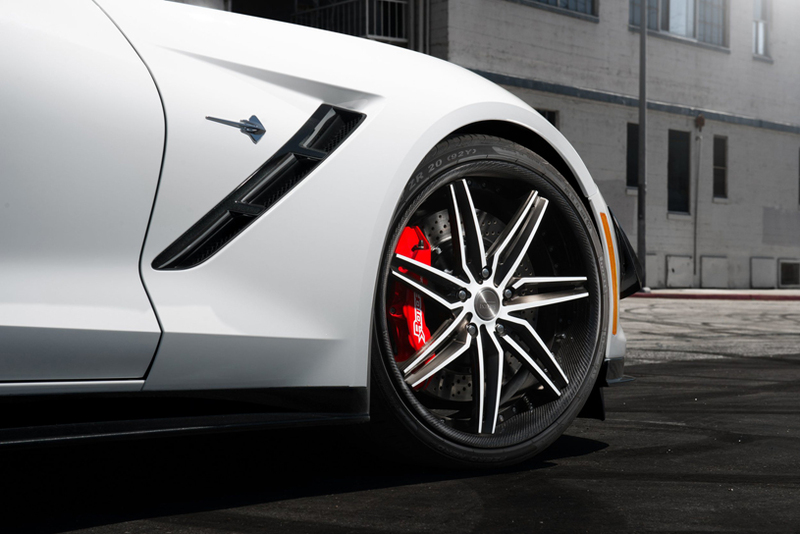 Offered in 15" (380mm x 34mm) or 16" (405mm x 36mm) 2-piece floating discs with t-billet aluminum hat to produce the ultimate brake torque, these oversize discs provides exceptional heat dissipation to eliminate brake fade. All systems are ABS compatible, direct bolt on and include DOT-compliant steel braided brake lines and carbon steel (SC45) mounting brackets and hardware with minimal modifications required. 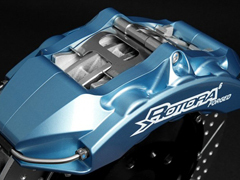 Rotora billet aluminum alloy racing calipers with sequentially-sized piston bore sizes engineered to each specific vehicle. 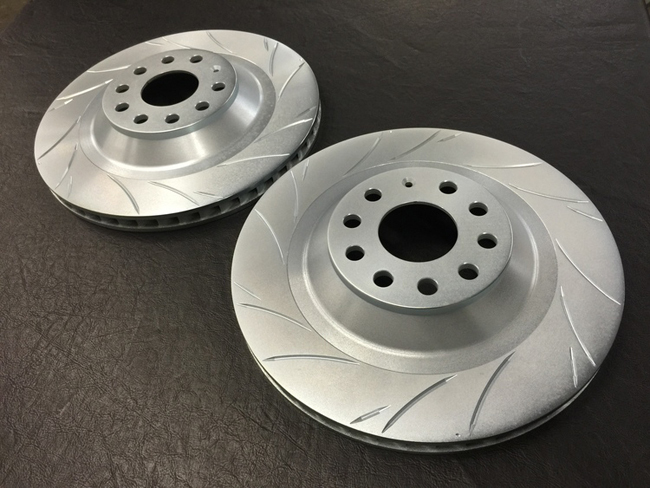 Rotora two-piece heat-treated directional vane disc system to improve airflow/cooling under severe braking. Slotted or drilled & slotted oversize 15" or 16" discs to ensure equal heat dissipation and increase thermal capacity while relieving the disc and brake pad surface free of excess debris. 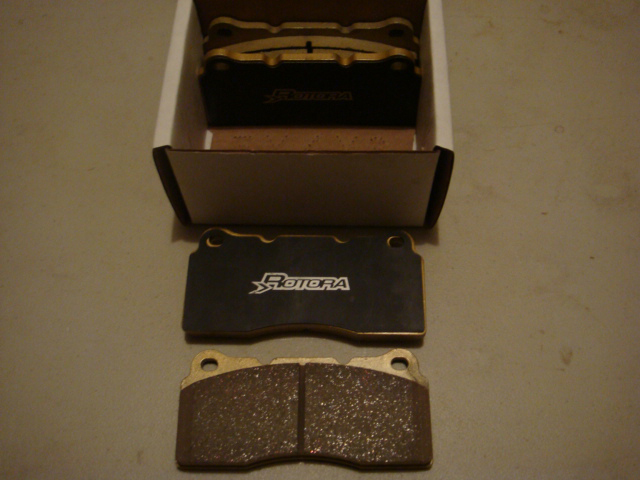 Rotora ceramic-formulated brake pads designed for extreme street and off-road applications with high co-efficient of friction and high temperature fade resistance. Rotora SC45 carbon steel mounting brackets and hardware. 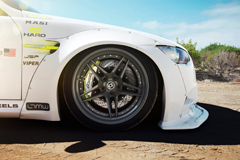 Wheel size and wheel clearance are important considerations when upgrading your brake system. The Rotora Brake System's larger calipers and oversized brake discs require wheels that provide the appropriate clearance! 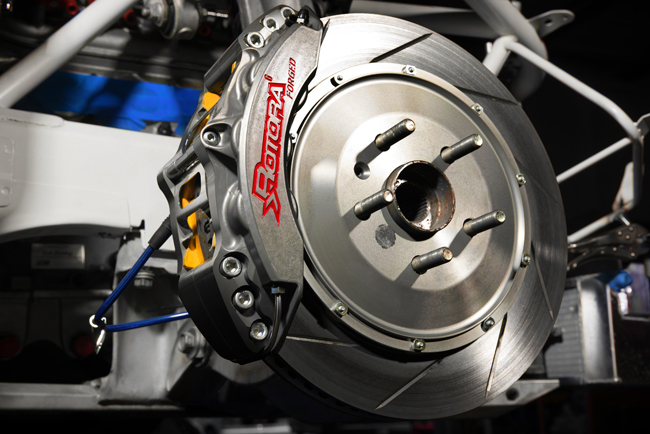 Made of billet aluminum alloy and CNC-machined to ensure the highest quality, Rotora's High Performance Brake Systems, available in 6-Piston, 4-Piston & 2-Piston Calipers, enable superior brake modulation while improving overall pedal feel to ensure equal distribution of weight transfer when braking. To achieve this proportional front-to-rear brake bias, Rotora's opposing piston calipers are fine tuned by increasing the clamp load to the optimal level while utilizng the stock master cylinder to retain overall front-to-rear brake bias. Rotora's full big brake system design delivers excellent initial bit, exceptional modulation and consistent pedal feel for street and track use applications. All systems are ABS compatible, direct bolt-on and include DOT-compliant steel braided brake lines and carbon steel (SC45) mounting brackets and hardware with minimal modifications required. Rotora ceramic-formulated brake pads designed for extreme street and off-road applications with high co-efficient of friction and high-temperature fade resistance. Disc Types: Plain, slotted or drilled oversized discs. Rotora no longer offers the drilled and slotted disc option. The Rotora Caliper Kit offers a cost effective solution to maximize braking performance by utilizing the vehicle's original brake disc. Designed to fit under stock-sized wheels, Rotora's Caliper Kit delivers superb braking power and exceptional modulation and appearance. The Rotora Caliper Kit utilizes the stock master cylinder to retain overall front-to-rear brake bias. All kits are ABS compatible and direct bolt on replacement with very minimal modifications required. 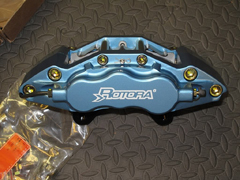 Rotora billet aluminum alloy mini-4, mini-6, 4 or 6-piston racing calipers with sequentially-sized piston bore sizes engineered to each specific vehicle. Rotora ceramic-formulated pads designed for extreme street and track application with high co-efficient of friction and high temperature fade resistance. Standard Caliper Color: red or metallic blue. Custom Caliper Color: dark blue, chrome, gunmetal, gold, silver, black or yellow (lead time of 60 days depending on application). Ceramic Pads: Rotora offers a wide range of ceramic compound pad grades. Refer to brake pads section to assist in selection. Disc Types: Plain OEM disc, slotted or drilled &slotted direct replacement discs. Developed with the same parameters as the Original Equipment (OE) specifications in both quality and finish, Rotora's Direct Replacement Brake Discs are assured to meet and exceed all vehicle manufacturer's specifications and tolerances under the worldwide ISO 9001 quality standards. CNC-machined and balanced for optimum performance, Rotora's Brake Discs feature special segmented slot or drill & slot pattern which is applied to the disc's front and back surfaces to ensure maximum heat and gas dissipation for greater stopping power and minimize warping and cracking caused by repeated, high stress, high temperature braking. With an "e-coat" (black) plating finish as an added protective layer to reduce corrosion and prolong disc life, Rotora's Brake Disc quality guarantees top performance and longer durability. Mill balanced to eliminate disc vibrations. Uniform thickness and finish of braking surface to ensure improved pad to disc fitment. Precise tolerance to ensure correct run-out. Developed with the same parameters as the original equipment in both quality and finish. For daily driving, basic OEM disc is preferred. Segmented slot pattern for improved brake pad grip and pedal feel. Cleans away debris between brake pad and disc. Minimizes warpage and brake fade resistance. Ensures maximum heat and gas dissipation. For more severe applications (including SUVs and Trucks), slotted is preferred. Segmented radius drill & slot pattern for improved brake pad grip and reduced noise. Ensures heat and gas dissipation. For street and light track use, drilled & slotted is preferred. Rotora Ceramic-Carbon Disc Brake Pads are the latest high performance street and race pads to be introduced into the aftermarket. 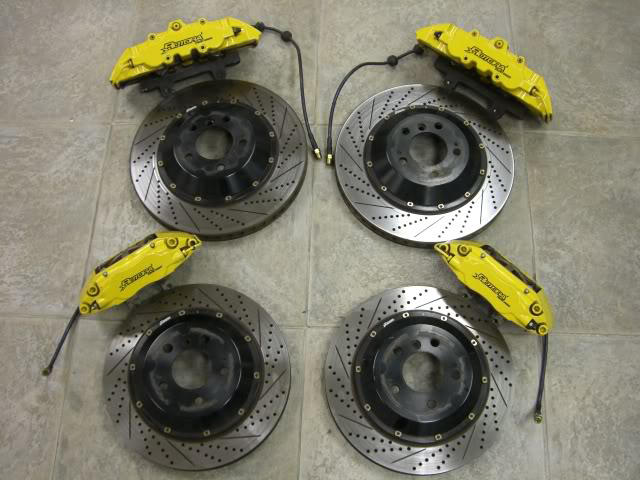 Rotora has applied the same materials, engineering and quality standards from the formulation used in its high performance brake systems to OEM vehicles with stock calipers. 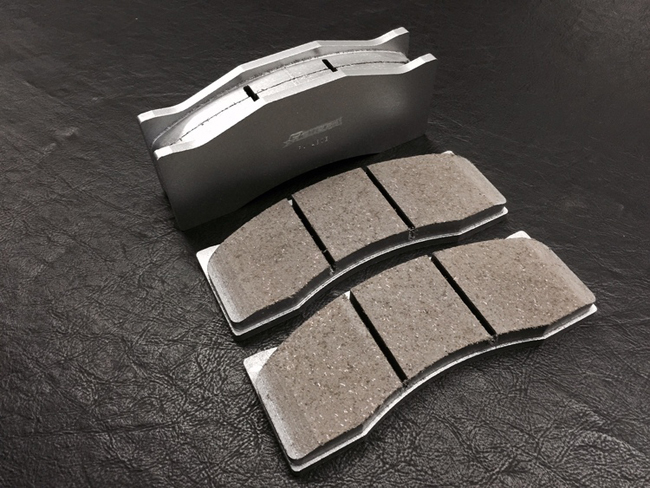 Designed for extreme street or track and hard braking applications, Rotora brake pads feature ceramic-carbon strengthened non-asbestos formulation with a high co-efficient of friction and high temperature fade resistance with quick recovery to offer more consistent pedal feel for driver confidence. Rotora is constantly developing and refining new ceramic-carbon brake pad compounds and new variations will offer nothing but the very best in all aspects of brake controllability and reliability. The H2 High-Ceramic Pad offers a solid brake fade resistance to increase driver's controllability. Whether weekend light track, drifting or daily driving, Rotora's ceramic-formulated H2 pads accommodate all driving styles, track lengths and environmental conditions. The ideal pad for all-around performance, daily street and track ready. The top of Rotora's ceramic pad range is the H8 Ceramic-Metallic Pad, the road race-spec upgrade offering tremendous fade resistance and thermal stability under high brake disc temperatures. Recommended for serious racing, H8 ceramic-metallic pads produce high coefficient of friction thereby providing ultimate stopping power and excellent pedal feel response from the very start. With strong initial bite and consistent Mu level, this is the ideal pad for road racing/endurance/high circuit. Rotora Stainless Steel Braided Brake Lines prevent brake hose expansion under pressure and improve stiffer pedal feel. Rotora's Stainless Steel Braided Lines meet D.O.T. Compliance Standards and are pressure tested to meet FMVSS-106 (Federal Motor Vehicle Safety Standards). All lines include fittings, hoses and all necessary hardware. "CONFIDENCE IS GOOD. CONTROL IS BETTER."